Meet Your School Board Candidates! 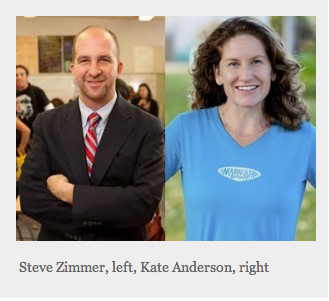 Before you vote on March 5th, come meet your Board District 4 LAUSD school board candidates, Kate Anderson and Steve Zimmer tomorrow night, Thursday, January 24th 5:30p at The Boys and Girls Club in Venice. Here’s your chance to hear from and ask them questions. For a quick backstory, read LA School Report’s overview of the candidates HERE. More on the LAUSD School Board HERE. Board Districts 2 (Garcia), 4 (Zimmer), and 6 (Martinez) term out on 6/30/13. The election is March 5th. Couldn’t make it? View the recording of this Candidate Forum HERE. This entry was posted in Announcements, LAUSD News and tagged Board District 4, Candidate Forum, election, Kate Anderson, LAUSD, school board candidates, Steve Zimmer, Westside Schools by gomama. Bookmark the permalink. except I know I am getting knowledge every day by reading thes pleasant articles.